Merida the Beautiful … Wait. What? Since when was Merida the beautiful princess? Wasn’t she Merida the Brave? Wasn’t she an anti-princess, a strong and feisty fighter, defender of her own virtue, thank you very much. British Canadian blogger Sarah Jay takes a closer look at Merida merchandising. My little guy had saved up enough money to buy himself a new Star Wars figure and as they happened to be on sale at Toys R Us this week, we took a quick trip there this evening. From our vantage point on the Planet Alderaan, (Star Wars central) we looked out into a galaxy far, far away, across the aisle, to the shimmery glare of the Planet Holy-Hell-Everything-Is-Pink-and-Shiny. I never know whether to laugh or cry at Toys R Us, at the almost-comical gendered separation of the toys. Today, my internal cursing at the Toys R Us marketing team was interrupted by my 5-year old son asking ‘Why do they have earrings with Merida on them, mummy?” Why indeed my smart young man, why indeed. So we left the Planet Alderaan, with a Stormtrooper in hand, to take a closer look at the odd assortment of Brave merchandise, luring us over to the Planet Pink ‘n Shiny. The display of Brave merchandise was quite strange – you would have no way of knowing what the movie is really about by looking at any of the packages. This package for example – the one the kid was referring to – was just weird. 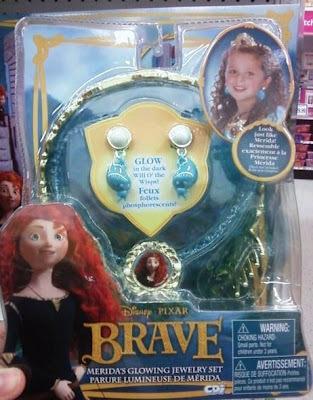 It’s a package of glow-in the-dark earrings, a tiara and a necklace I think, so your kid can ‘look like Merida’. Um, I think not. I’m not saying you need to buy a giant black horse for your kid to play dress-up, but the jewellery set is totally missing the point. Did she actually even wear earrings, ever? At any point in the movie? My kid doesn’t think so…and if she did, they probably didn’t glow-in-the-dark. Just sayin’. If you haven’t seen the movie Brave, and your total knowledge of the film is that it’s just another Disney Pixar movie featuring a Princess protagonist, then you’ll be well forgiven for presuming that there’s nothing wrong with this toy – or others like them – you might be thinking it’s just the same old princess story but with different hair. But that’s where you’d be wrong. You see the whole point is that Merida isn’t like all the other princesses. She’s feisty, and independent, and active and physical. She rips her dresses, gets muddy and dirty, spends no time in front of a mirror, had no love interest, doesn’t need or want rescuing, and is a brilliant horseback archer. That’s what we love about her. She’s fierce but vulnerable, defiant but lovable and fearless but tender – and all the million things and contradictions that ‘girly’ can be. But she’s certainly not the same old princess. So why Disney would recycle all these products from princesses-gone-by and market these stupid same-old products is beyond me. It’s a cop-out and my 5 year old called them out on it tonight. 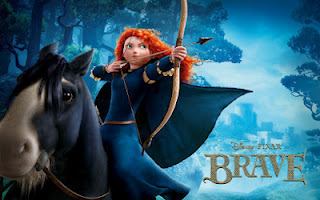 As my little critic pointed out – if you want to dress up like Merida- forget the earrings -get a bow and arrow.